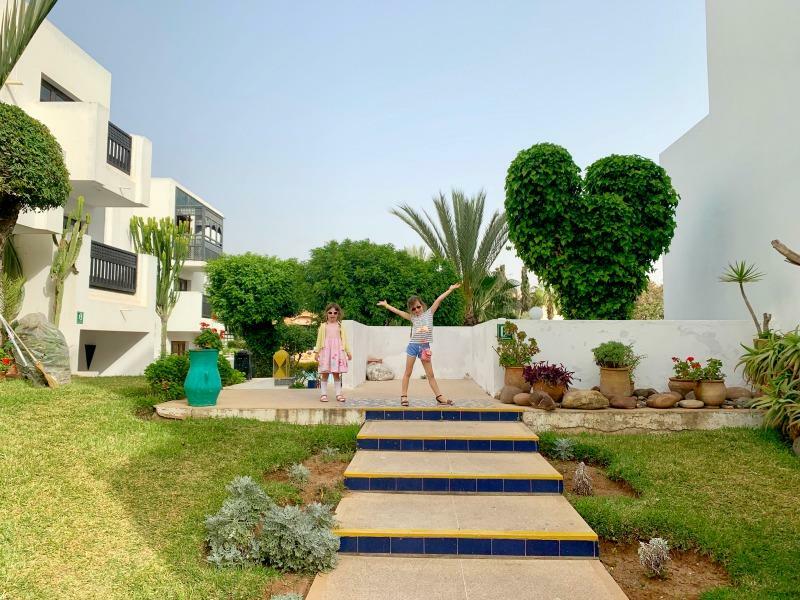 Our week in Cornwall really brought it home to me that great holiday vibes are right on our doorstep and there are a few things that make a trip in the UK very special indeed. One box we certainly have to tick when travelling with the kids is looking for the best fish and chips. 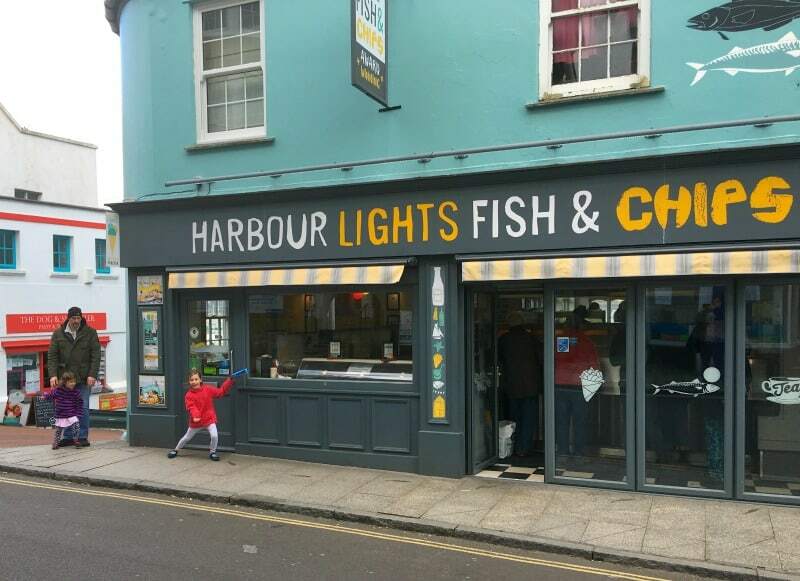 While we were in Cornwall we were invited to Harbour Lights Falmouth to check out their fish and chip restaurant. We had very much enjoyed a morning exploring the National Maritime Museum, but the kids tummies were alerting us all to the fact they were getting hungry. Roll on the days when they can just articulate ‘I’m getting a bit peckish’ without the addition of a full on meltdown, if you know what I mean. Harbour Lights is a short walk away from the National Maritime Museum on Arwenack Street, so it makes for the perfect pitstop for Falmouth fish and chips. We also discovered it was crowned the UK’s best independent fish & chip shop in January 2017 so it seemed like a good choice for the best fish and chips in Cornwall and beyond. Walking into Harbour Lights is an experience in itself, and everyone’s spirits rose immediately as we were greeted by our friendly waitress. 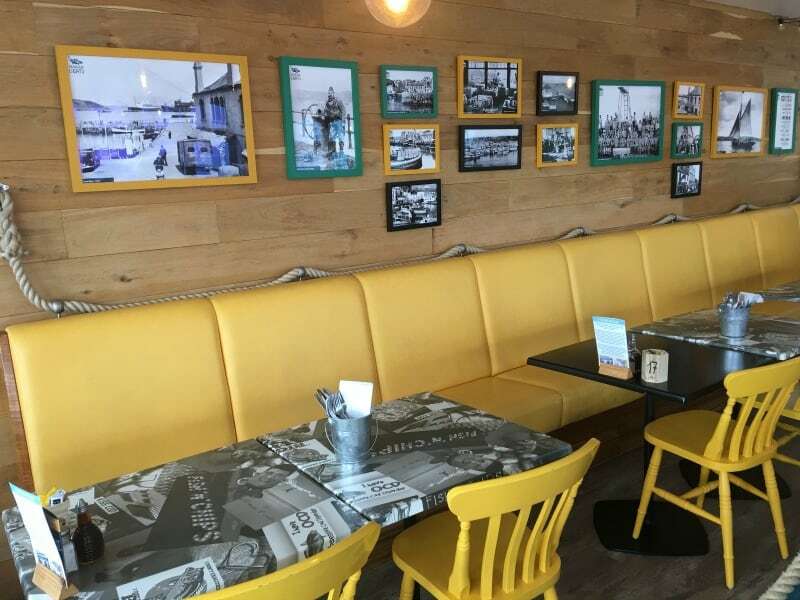 The decor at Harbour Lights is bright and cheery with just the right amount of nostalgia to make it a really enjoyable place to eat fish and chips in Falmouth. We were shown to our table and to my delight we had the most amazing view of Falmouth harbour on what was turning out to be a beautiful blue sky day in Cornwall. As Falmouth restaurants go Harbour Lights is in a great location. The Harbour Lights menu is particularly impressive and offers lots of variety as well as traditional fish and chips. 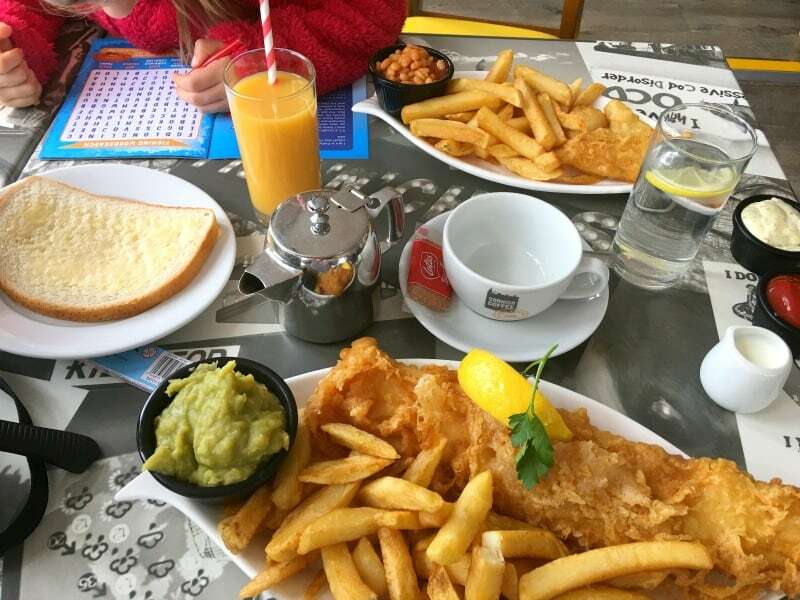 The children’s menu, for example, offered a range of fish bites, sausages, veggie sausage or chicken nuggets served with chips or salad if you preferred a healthier option for the little ones. You can also add garden peas, mushy peas or baked beans and an ice cream is included all for just £6.50. The portion size was excellent and young children could probably share one meal and still feel very full. I found during our holiday that Cornwall restaurants in general cater very well for kids, but Harbour Lights did a particularly great job to be honest. There was simply no question that Daddy and I were going to have fish and chips, and I ordered the Harbour Lights Famous 5 option which includes homemade mushy peas, bread and butter and unlimited tea. When the meals arrived they looked amazing. The batter looked crisp and light and the chips were ticking all those traditional boxes. before we had even started tucking in, we knew we had stumbled across one of the places to eat in Falmouth. Once we started tucking in it was clear that this was definitely one of the best fish and chip shops I’d ever experienced and Daddy and the girls seemed to agree from the silence that had now descended on the table. It was a far cry from the hangry meltdowns we’d experienced 10 minutes earlier. As well as serving utterly delicious food, Harbour Lights is a great choice for fish and chips for a number of other reasons. Locally caught fish is delivered to the restaurant in Falmouth daily ensuring the very freshest cod ends up on your plate. You will also be very pleased to know that all the fish used in the restaurant is responsibly sourced making sure that they do not adversely effect the number of fish found off the coast of Cornwall. What goes better with fish and chips than a big cone of ice cream for pudding? When the girls had finished their plates, our waitress presented them each with a cone filled with locally produced Moo Maid ice cream. Seeing as the girls were on desserts, Daddy and I decided to join them so as to provide you with the best restaurant review possible of course. I can certainly vouch for the lemon tart and Daddy tested out the golden syrup sponge, which looked amazing. There were happy tummies and smiles all round and it was clear to me that Harbour Lights cared about not only about the fish they are serving but the entire experience in their restaurant by making sure they offered the best locally sourced products to compliment their own menu. The Moo Maid ice cream for example, is divine being both creamy and full of flavour. 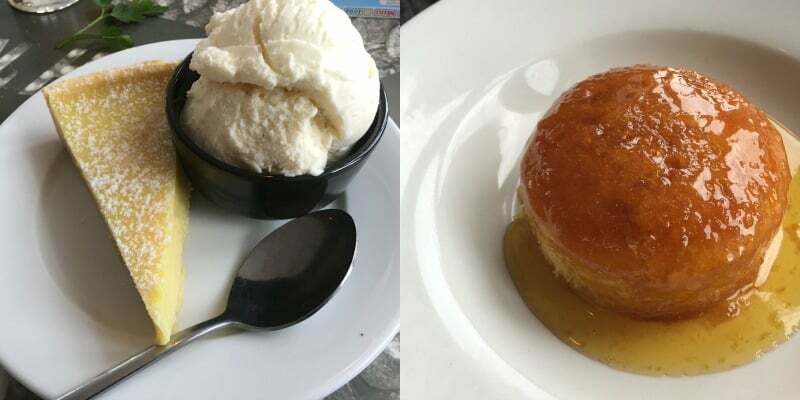 We throughly enjoyed eating at Harbour Lights, and if you are looking for the best restaurants in Falmouth I would strongly recommend you pay them a visit, just like the Countess of Wessex did last year as she had heard so many good things about their food. If you don’t want to eat in, it’s also a great Falmouth takeaway option too. I doubt there are many fish and chips shops in Cornwall that can claim that a member of the Royal family have called in for lunch can they? I’m sure she found her visit to Harbour Lights as delicious and memorable as we did, and I don’t think you’ll be disappointed if you are on the hunt for places to eat in Cornwall. We were provided with a family meal at Harbour Lights in Falmouth in exchange for this post, but all thoughts and opinions are our own. I’m not really a fan of fish & chips but when I used to live in Wales there was this awesome pub on Anglesey near Red Wharf Bay called Ship Inn that made ME love fish & chips!